St. Jude Medical, Inc., a global medical device company, today announced the U.S. launch and first post-approval implants of the St. Jude Medical Axium™ Neurostimulator System for dorsal root ganglion (DRG) stimulation to treat patients with chronic pain that has been hard to control with traditional spinal cord stimulation (SCS). First commercial implants of the device occurred at the Center for Pain Relief in Charleston, W.Va. by Dr. Timothy Deer, and at the Sutter Santa Rosa Surgery and Endoscopy Center in Santa Rosa, Calif., by Dr. Jason Pope. In the coming weeks, DRG implants will occur in half the states in the United States. St. Jude Medical has already partnered with implanting chronic pain specialists who will conduct more than 100 procedures in 59 centers nationwide in the first month after launch. Over the course of the year, the company expects to have more than 300 physicians across the country trained to effectively deliver DRG therapy to patients in immediate need of targeted stimulation to alleviate chronic pain resulting from moderate to severe chronic intractable pain of the lower limbs in adult patients with Complex Regional Pain Syndrome (CRPS) types I and II. "Although many chronic pain patients can find relief from a traditional spinal cord stimulation device, many patients suffering from focal chronic pain including CRPS I and II don't receive adequate pain relief from spinal cord stimulation," Dr. Deer said. "Adding dorsal root ganglion stimulation with the Axium neurostimulator system to my therapeutic arsenal is an exciting step in the treatment of chronic intractable pain of the groin, knee and foot. I'm impressed with the speed in which I am able to reach and stimulate the dorsal root ganglion, something I was unable to do before the Axium neurostimulator system. For the first time, I now have a device designed specifically for the large and growing number of under-treated chronic pain patients I could not previously serve." Stimulation of the DRG, a spinal structure densely populated with sensory nerves that transmit information to the brain via the spinal cord, allows physicians to treat the specific areas of the body where pain occurs. The St. Jude Medical Axium neurostimulator system is the only therapeutic approach of its kind designed to treat moderate to severe chronic intractable pain of the lower limbs in adult patients with CRPS. Patients with CRPS are often underserved by conventional medical management and many interventional pain procedures. Many patients have tried multiple treatment options without receiving adequate pain relief. "Stimulation of the dorsal root ganglion is the first therapy option designed specifically for patients suffering from complex regional pain syndromes. This serious and traditionally challenging to treat chronic pain condition can occur from complications to recovery from surgeries such as knee arthroscopy, foot surgery or hernia surgery," Dr. Pope said. "Having a treatment option rooted in clinical evidence fundamentally changes our approach to treating patients. I am thrilled to be among the first in the United States to offer previously underserved patients this revolutionary technology." According to the Institute of Medicine, chronic pain affects more than 100 million Americans, an incidence rate which outpaces heart disease, cancer and diabetes combined. Neuropathic pain represents one of the most prevalent yet under-treated forms of chronic pain in the United States, with an estimated one in every 10 adults over the age of 30 suffering from the condition. "Since the approval of dorsal root ganglion stimulation with the Axium system in February 2016, we have focused on a strategic rollout with a disciplined training program for physicians across the country. We believe this approach ensures patient access to this highly effective new therapy to help manage their chronic pain," said Dr. Allen Burton, medical director of neuromodulation and vice president of medical affairs at St. Jude Medical. "The first Axium system implants in the United States reflect our ongoing commitment to working with our physician partners to deliver on our promise to transform the treatment of chronic pain." Initial results from the ACCURATE IDE study, the largest study to date evaluating patients suffering from neuropathic chronic intractable pain associated with CRPS I and II or peripheral causalgia (PC), showed DRG stimulation provided patients with superior pain relief over traditional tonic SCS. 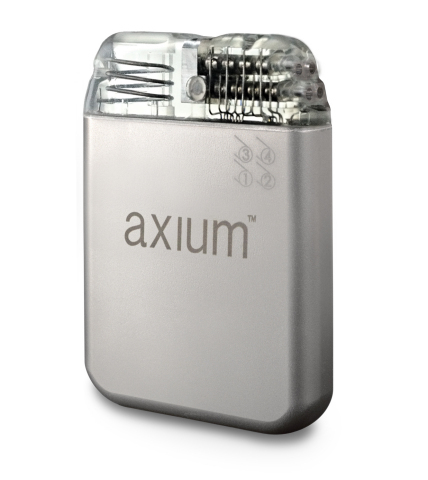 Approval of DRG stimulation with the St. Jude Medical Axium Neurostimulator System was based in part on the results of this study in which patients were randomized to receive either DRG stimulation delivered by the Axium neurostimulator system or traditional tonic SCS therapy delivered by a competitor's system. For more information about St. Jude Medical's focus on the treatment of chronic pain, visit the St. Jude Medical Chronic Pain Media Kit or the St. Jude Medical PULSE Blog. This news release contains forward-looking statements within the meaning of the Private Securities Litigation Reform Act of 1995 that involve risks and uncertainties. Such forward-looking statements include the expectations, plans and prospects for the Company, including potential clinical successes, anticipated regulatory approvals and future product launches, and projected revenues, margins, earnings and market shares. The statements made by the Company are based upon management's current expectations and are subject to certain risks and uncertainties that could cause actual results to differ materially from those described in the forward-looking statements. These risks and uncertainties include market conditions and other factors beyond the Company's control and the risk factors and other cautionary statements described in the Company's filings with the SEC, including those described in the Risk Factors and Cautionary Statements sections of the Company's Annual Report on Form 10-K for the fiscal year ended January 2, 2016. The Company does not intend to update these statements and undertakes no duty to any person to provide any such update under any circumstance.